On Sunday, I presented a House citation to Christian Stezelberger at his Eagle Scout Court of Honor ceremony. A member of Troop 362 in Bethlehem, he is the son of Gerald and Jayne Stezelberger and lives in Washington Township. 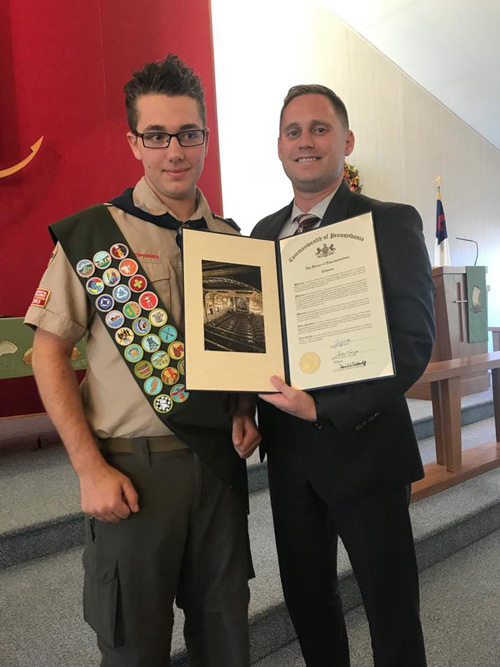 For his Eagle Scout project, Christian packaged 50 boxes of various useful items, such as toiletries, canned goods, magazines and snacks, which were sent to a Lehigh Valley-based Army unit stationed overseas. 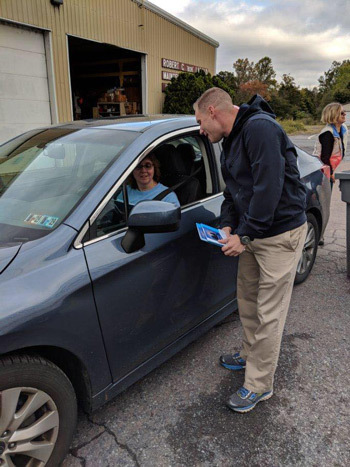 Last Saturday, I co-hosted a paper shredding event with Sen. Pat Browne (R-Lehigh) at Robert “Bob” LaBold Maintenance Building in Slatington. About 75 people stopped by to have their documents securely destroyed. I hope to hold a similar event next year. A new law will help prevent food stamp fraud by imposing tougher penalties for the illegal trafficking of Supplemental Nutrition Assistance Program (SNAP) benefits. Act 160 of 2018 creates a new penalty for the fraudulent trafficking of SNAP benefits in an amount greater than $2,500. Violators will be required to pay restitution of up to three times the amount of fraud they committed. Under the prior law, the recipient who sells the benefits and the merchant who creates the illegal market for and trafficks in those benefits are treated the same. The law stems from a case uncovered last year by the Office of State Inspector General in which a Harrisburg restaurant traded drugs for electronic benefit transaction (EBT) cards and bought thousands of dollars of supplies from a food wholesale club to be resold for profit. This serious problem across Pennsylvania takes food from our most vulnerable citizens. Residents may apply for LIHEAP online or by contacting the County Assistance Office in their county of residence. Applications and assistance completing them also are available in my district offices. From 10 a.m. to 2 p.m., residents can drop their medications off at the following local sites. More sites are being added daily.